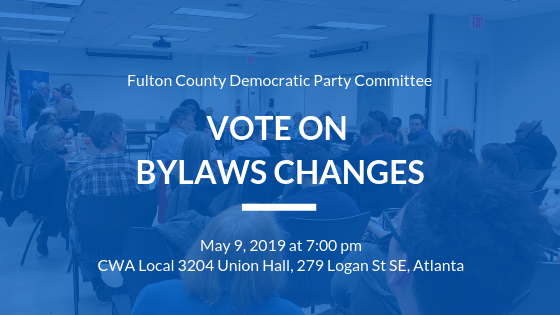 At the end of 2018, the Fulton County Democratic Party Committee created a bylaws committee to review our bylaws and recommend changes. After careful consideration, the committee now presents its proposed changes to the bylaws. Post Seat Holders will vote on these changes at the next business meeting on May 9. A quorum of 40% of Post Seat Holders is needed in order to hold a vote. Click here for a list of Post Seat Holders. Many of the proposed edits will create consistency throughout the bylaws in formatting and naming conventions. There are also adjustments to the officer appointment timeline, as well as the quorum requirements. Click here to view the proposed edits to our bylaws in their entirety. Click here for an explanation of the changes and reasoning behind them. 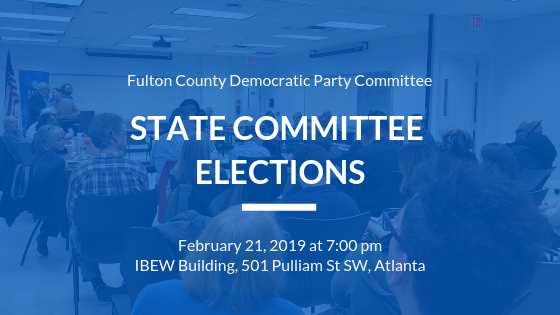 Please email membership@fultondems.org with any questions. 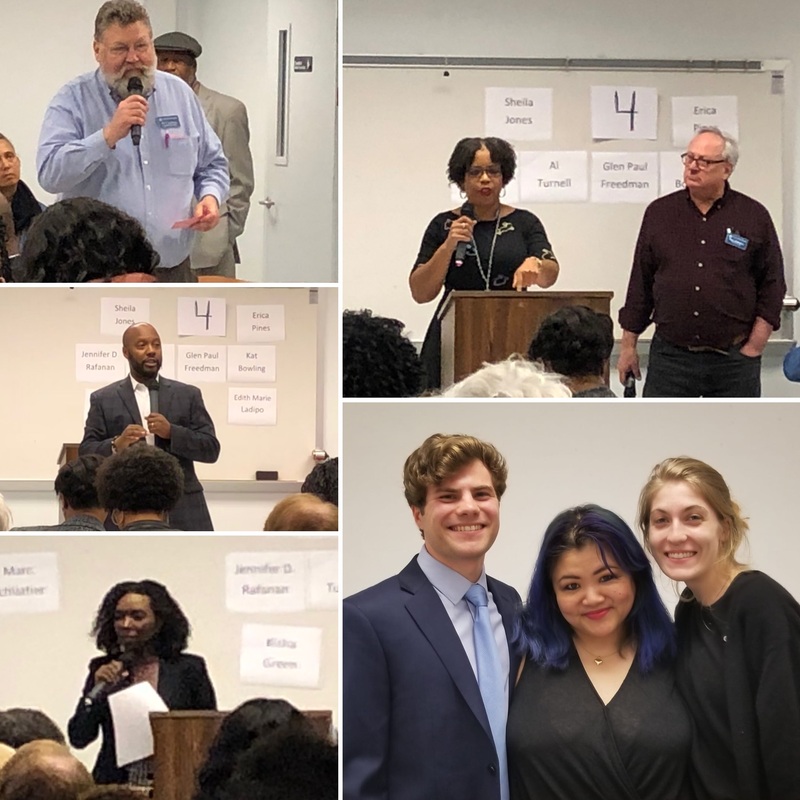 Last night at our monthly action meeting, our post seat holders elected our state committee members to represent us at the state party level for the next four years. We want to thank everyone who ran to be on the state committee, and we encourage everyone to stay involved! Come to our events, become a post seat holder (if you haven’t already!) and pay your $25 dues! Fulton County will have one week of early voting for the runoff for Secretary of State and Public Service Commissioner. Election Day will be December 4. Click here for the official list from Fulton County Board of Elections. Click here for an interactive map of all locations. If you have any questions or run into any issues while voting, call the Democratic Party of Georgia’s voter protection hotline at 888-730-5816. When you look at your ballot for the November 6th election, you’ll see five constitutional amendment options, two statewide referenda, a Fulton county referendum, and possibly a city referendum or two. Below, you can find plain-language explanations, plus recommended voting suggestions. This information is meant to be used as an informational guide; we encourage all voters to make informed decisions and vote how they individually choose. Click here for a printable pdf of in-depth recommendations and explanations from Stacey Abrams and the Democratic Party of Georgia. See below for a shorter version that includes Fulton County initiatives. How it will look on your ballot: Without increasing the current state sales tax rate, shall the Constitution of Georgia be amended so as to create the Georgia Outdoor Stewardship Trust Fund to conserve lands that protect drinking water sources and the water quality of rivers, lakes, and streams; to protect and conserve forests, fish, wildlife habitats, and state and local parks; and to provide opportunities for our children and families to play and enjoy the outdoors, by dedicating, subject to full public disclosure, up to 80 percent of the existing sales tax collected by sporting goods stores to such purposes without increasing the current state sales tax rate? Recommendation from Stacey Abrams and the Democratic Party of Georgia: Vote Yes. Additional note from the Fulton County Dems: This amendment allows the General Assembly the ability to allocate funds, but it does not REQUIRE them to. How it will look on your ballot: Shall the Constitution of Georgia be amended so as to create a state-wide business court, authorize superior court business court divisions, and allow for the appointment process for state-wide business court judges in order to lower costs, improve the efficiency of all courts, and promote predictability of judicial outcomes in certain complex business disputes for the benefit of all citizens of this state? The first is that the judges are appointed (makes sense for a ‘specialized’ court for expertise). This is the first instance of appointed rather than elected judges. The second is the concern that it would be used to further the interests of business, especially against workers and unions. How it will look on your ballot: Shall the Constitution of Georgia be amended so as to revise provisions related to the subclassification for tax purposes of and the prescribed methodology for establishing the value of forest land conservation use property and related assistance grants, to provide that assistance grants related to forest land conservation use property may be increased by general law for a five-year period and that up to 5 percent of assistance grants may be deducted and retained by the state revenue commissioner to provide for certain state administrative costs, and to provide for the subclassification of qualified timberland property for ad valorem taxation purposes? Additional note from the Fulton County Dems: Georgia’s forestry economy depends on the ability to sustain the ‘growing season’ for these ‘farmers’. How it will look on your ballot: Shall the Constitution of Georgia be amended so as to provide certain rights to victims against whom a crime has allegedly been perpetrated and allow victims to assert such rights? Additional note from the Fulton County Dems: The criticism for those voting no is that this is already in the laws of Georgia and it infringes on the rights of those accused. The justification is mainly to protect women whose rights are often ignored vs. a ‘known’ abuser who will not be denied. How it will look on your ballot: Shall the Constitution of Georgia be amended so as to authorize a referendum for a sales and use tax for education by a county school district or an independent school district or districts within the county having a majority of the students enrolled within the county and to provide that the proceeds are distributed on a per student basis among all the school systems unless an agreement is reached among such school systems for a different distribution? Additional note from the Fulton County Dems: Allows a larger school to move forward with an E-SPLOST without a smaller system within the same county. It does take some negotiating power away from the smaller systems. How it will look on your ballot:Do you approve a new homestead exemption in a municipal corporation that is located in more than one county, that levies a sales tax for the purposes of a metropolitan area system of public transportation, and that has within its boundaries an independent school system, from ad valorem taxes for municipal purposes in the amount of the difference between the current year assessed value of a home and the adjusted base year value, provided that the lowest base year value will be adjusted yearly by 2.6 percent? How it will look on your ballot: Shall the Act be approved which provides an exemption from ad valorem taxes on nonprofit homes for the mentally disabled if they include business corporations in the ownership structure for financing purposes? How it will look on your ballot: Shall the Act be approved which repeals the amendment to the Constitution of Georgia creating within Fulton County the Fulton County Industrial District and prohibiting the governing authority of Fulton County from levying any tax for educational purposes within the boundaries of an independent school system? How it will look on your ballot: Shall the Act be approved which provides a homestead exemption from Fulton County ad valorem taxes for county purposes in the amount of $50,000.00 of the assessed value of the homestead for residents of that county who are older than 65 years of age? You might also see city questions about taxes or Sunday Alcohol Sales. The Fulton County Dems recommend voting yes on all Sunday Alcohol Sales referenda. Ready to vote? Click here to find your nearest early voting location and times of operation. Fulton County will have three weeks of early voting for the Midterm elections, including two Saturdays and two Sundays. There will also be a variety of “voting outreach” centers (see bottom of this post) open at senior centers and colleges throughout the county where any Fulton County registered voter can cast a ballot. Early voting will run from Monday, October 15 till Friday, November 2. October 29 – Friday, November 2, 7:00 am. – 7:00 pm. In addition to 20 early voting locations, Fulton County will also offer special “voter outreach” locations throughout the early voting period to reach seniors and students in locations that are more convenient to them. These special early voting locations will only be open for two days each, and are only for individuals who are registered in Fulton County. Did you know that anybody can vote by mail in Georgia? You don’t need a reason, but you do need to fill out a form to request a ballot. Make sure that your voter registration is correct. You can check your status and registered address at the My Voter Page. If you need to make changes, you can quickly make updates online. Download this form from the Secretary of State’s website. Complete the form in full, including your signature at the bottom. You don’t need to include your Driver’s License number, although it could help your application be processed quicker. Mail your application to Fulton County Registrar at 130 PEACHTREE STREET 2186 SW, ATLANTA, GA 30303-3460. The Democratic Party of Georgia recommends you get your application in the mail by Friday, October 26. You can check when your application is received on your My Voter Page. You will receive an absentee ballot in the mail, along with instructions and a return envelope. (The county registrars will begin mailing them out in mid-September). Once you receive your ballot, complete it, making sure to put your address and date of birth on the outer envelope where indicated, and don’t forget to sign your ballot. When you mail your ballot back to your county registrar (address above), make sure to use two stamps. You can check to see when your ballot is received on your My Voter Page. Ballots must be received by November 6, 2018 in order to be counted. Check out the Democratic Party of Georgia’s FAQ here. Is voting by mail secure? Yes! You can track your ballot’s progress on your My Voter Page. You’ll see the date your ballot was mailed to you, the date it was received by the county registrar, and the date it was counted. The DPG also has a full-time Voter Protection Director who will have representatives on-site to watch ballot counts on election day (plus a team of lawyers to respond to any issues that may arise!). What if I check My Voter Page and I don’t see my ballot received by the registrar? If your ballot hasn’t been received by the last day of early voting, call the county registrar (Fulton County: (404) 612-3816) and ask that they cancel your ballot, then go vote in person. I’m not sure that my ballot will arrive at the registrar’s office by election day! What do I do? You can hand your ballot into the registrar yourself. Why should I vote absentee? It’s an easy and verifiable form of voting. Plus, if any issues arise with your registration or ballot in the process of voting, the DPG will be able to help correct the issues so that your vote will still count by election day. What if I have more questions? Call the Democratic Party of Georgia’s Voter Protection Hotline at 888-730-5816. They’re here to help, no matter how small your question may seem! Congratulations to Our 2018 State Convention Delegates! Click on I Want To Register To Vote! Check all the boxes to verify that you are eligible to vote and click Begin Voter Registration. Choose “Change Voter Registration” at the top of the page, check the box for “Address Change”, and fill in your county of residence, name, birthday, and driver’s license number. Follow the prompts and fill in your new mailing address and confirm its accuracy. Submit your registration and that’s it! Your registration must be approved by your county registrar. You can check the status of your registration on your My Voter Page: https://www.mvp.sos.ga.gov/ You should receive a postcard in the mail listing your voting location in about a month. Other ways to update your registration: You can print this form and mail it in (no stamp needed! ), or you can pick up a form at a local library or your county registrar’s office at 130 Peachtree Street, Suite 2186. Atlanta, GA 30303. Personal connections are the most effective way to get eligible voters involved in the political process, which motivated the North Fulton Democrats to create SCOPE–Steering Committee on Organizing Precincts for Elections. A precinct is the smallest breakdown of the electoral process. It includes everyone within a geographical area that votes at the same location. Everyone within the precinct has the same representatives at the city, state and federal levels. Precinct organizing helps to build connections and keep citizens engaged in politics year-around. It’s also an important grassroots arm of the Democratic Party. Volunteers in the precinct organizing program get to know their neighbors and learn what issues matter to them, which they can then communicate to candidates, current representatives and the Party so they can be better representations of their constituents. In return, volunteers also help communicate initiatives from candidates, current representatives and the Party to the voters, so they can keep up with issues and stay involved. SCOPE volunteers organize events like candidate meet-and-greets, postcard parties, phone banking, as well as making sure neighbors are registered and reminding them to vote. This is a long-term network-building initiative that will have lasting effects beyond the 2018 Midterms, even beyond the 2020 Presidential Election. Want to learn more? Click here to read our FAQ and sign up to be a volunteer! Precinct organizing fits into every schedule!